(Camden, NJ) – Today, Camden Mayor Frank Moran, Congressman Donald Norcross, and Camden County Freeholder Director Louis Cappelli gathered with Camden residents and other community leaders to watch the last steel beam be placed on top of the newest office tower to be constructed on Camden’s waterfront. 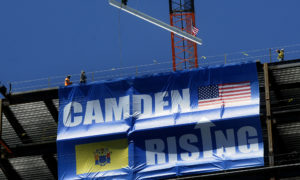 The topping-off ceremony marked another major milestone in the city’s ongoing revitalization, as well as the symbolic completion of the structural phase of the tower, which will serve as the new headquarters for three of New Jersey’s leading companies — Conner Strong & Buckelew, NFI, and The Michaels Organization. At 18 stories and 394,164 square feet, the tower is now the tallest building on Camden’s booming waterfront and brings almost 1,000 jobs to the city. The building also boasts a rooftop helipad, a six-level parking garage, and an open-air piazza on the eighth floor with a view of the Philadelphia skyline. Conner Strong & Buckelew, NFI, and The Michaels Organization are joining many other businesses, from the Philadelphia 76ers to Subaru, in making their way to Camden. The city is in the midst of an unprecedented turnaround, with crime down by about 40% since 2012 and more than $3 billion in new economic development and investment either recently completed, in progress, or about to begin. The new investment is transforming city neighborhoods, creating jobs for city residents, and making the city an attractive place to live, work, and play. The leaders of Conner Strong & Buckelew, NFI, and The Michaels Organization are also investors in 11 Cooper, a $48 million residential development bringing 156 new rental homes to the Camden waterfront – the first market-rate development on the waterfront in a generation. 11 Cooper is an amenity-rich luxury apartment community that will begin leasing in October 2018, with final delivery expected in Spring 2019.